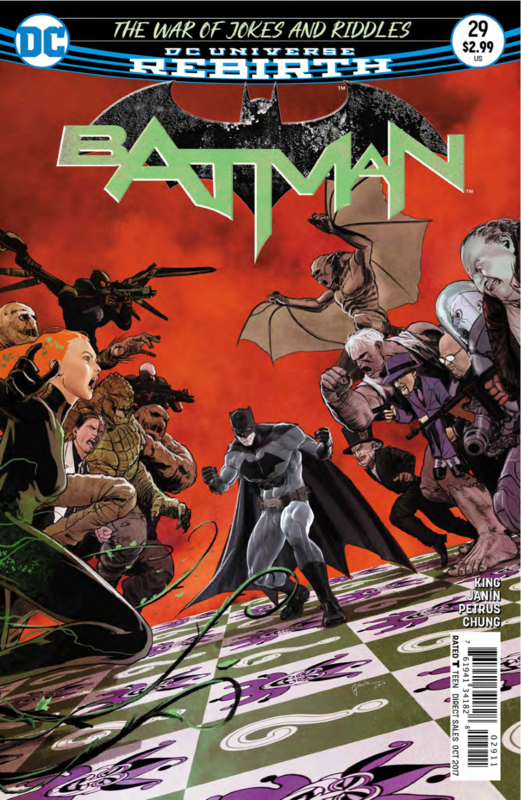 The entire issue takes place in Wayne Manor where Bruce Wayne has invited the Joker and the Riddler to dinner. They don’t know he’s Batman at this point in time. He is having them over as part of an interview-type of event so he can choose which one to pay off so he can end the war. It’s very strange and what doesn’t help that strangeness is that Batman’s entire rogue’s gallery is just standing in the dining room watching them eat. Why are they all there? It’s so bizarre. We actually get to see what happens in this entire event rather than being told but it takes up the whole issue. Right now, this scene doesn't feel important to the overall story and would like to find out what comes of this dinner. There is an intense feel the entire dinner, like I was waiting for someone to snap but it never happened. 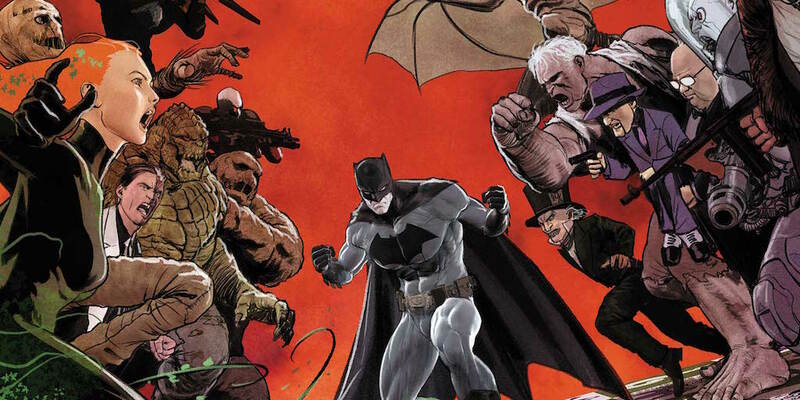 Bruce, Joker and Riddler didn’t engage in an all-out fight and I enjoyed that. They all felt they had a gentlemanly integrity to them. They were invited to this dinner and they're going to use their table manners, apart from once when Joker threw a knife at Riddler and he caught it. But that’s about it. The conversations they all had were intriguing and it was well written throughout. I may not agree with what Tom King has done with this story arc thus far but I still believe he’s an excellent writer and his dialogue in the issue proves this. I’m just very interested to see how this arc will end. Will it end on an epic fight? Or just another anticlimactic ending like the past couple arcs have had? 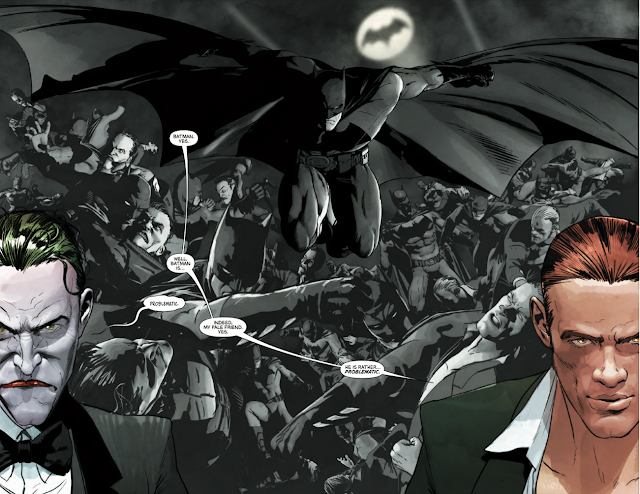 The art is still amazing, as always with Mikel Janin. His art is a perfect fit for this comic and I love his Batman design, especially. Even if I don’t like an issue of the War arc, at least I have amazing art to fall back on. Like the rest of the War of Jokes and Riddles arc, Batman #28 underwhelms. While it was intriguing to read and the art was great, we still didn’t get anything to advance the story or see anything about what this War really is. I just want to be done with this arc already or at least have it end amazingly.